Carex austrina (Small ) Mack. 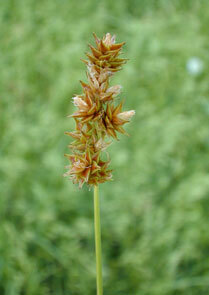 Also Called: Southern caric sedge. Culms: Prominently triangular, slender, stiff, wiry, rough, 8 to 40 inches long, much surpassing leaves, pale brown at base, often forming angle of 50 degrees or less with ground. Leaves: 5-10, on lower 1/4 of stem, flat to slightly grooved, thick, pale-green, up to 12 inches long, 1/12 to 1/5 inch wide, upper surface and margins rough. Sheaths: Open, tight, occasionally somewhat wrinkled, thickened at mouth, well-developed transparent band on inner surface. Inflorescences: Unbranched, oblong to cylindric in outline, .8 to 1.6 inch long, to .4 inch broad, 3-10 crowded spikes; spikes egg-shaped to nearly spherical, 1/5 to 1/3 inch, densely aggregated yet still distinguishable, 1-2 lower spikes sometimes separated from others; bracts bristle-like, lowest usually .4 to .8 inch long; staminate flowers above pistillate; perigynia 8-20 per spike, pale-green, ascending, with or without nerves, beak 2-toothed; pistillate scales egg-shaped, with green midvein, slightly shorter than perigynia, tips short-awned; staminate scales narrowly lanceolate, pale brown, tips long-pointed. Habitat: Open, dry, upland prairies, roadsides, and openings in limestone wooded slopes; sandy soil; prefers full sun.